Having decided rather last minute to visit Cambodia and knowing little about its history or culture, I decided to book a few bike tours upon arrival to get to know the place. I arrived in Siem Reap by plane and after an unusually groggy travel morning, I made it to my hotel after being slapped in the face by this new city’s noise, pollution, crazy traffic, and intense humidity. My transport from the airport to the hotel was by motorbike, so there I was… large pack wedged between the driver and his steering column with me sitting behind him, my small pack on my back. We bobbed and weaved through the traffic, sometimes riding on a side road or shoulder, sometimes riding on a main road, and occasionally riding on the wrong side of the road. The traffic whizzing all around us made me alert again and I realized that this was my first glimpse of what cycling through this city was going to be like. 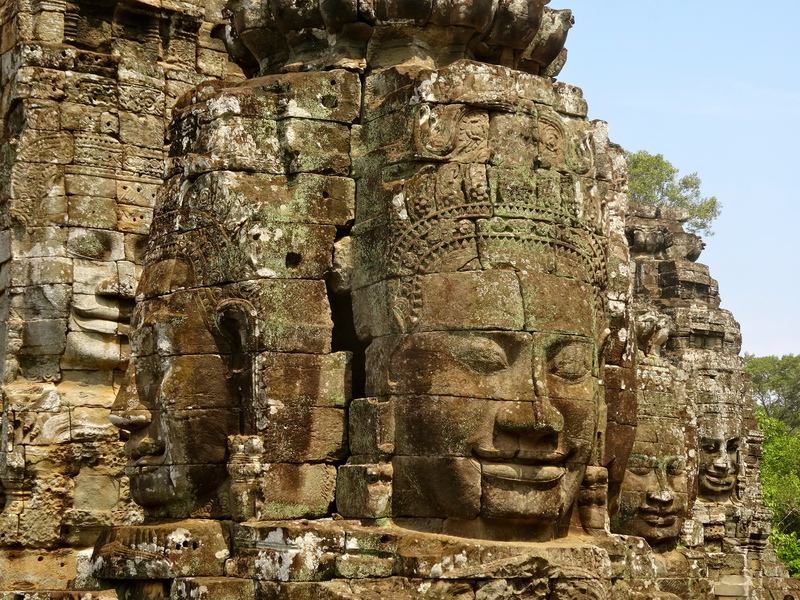 On my first full day, I booked a sunrise tour of Angkor Wat, Cambodia’s most well-known temple complex and the largest religious monument in the world. This meant waking at 4:15am in order to be ready for a 4:40am pick-up by the bike tour operator, Grasshopper Adventures. They were very punctual and I was the first stop, but I learned that there would only be one more stop because the tour operator caps the groups at six people to ensure a personalized experience, and the other party would be a family of four. On the way to Angkor Wat, we would have to stop at the ticket office to get our passes, which would include all temples within the Angkor Wat complex. For those thinking of visiting, it is $20 for a day pass, $40 for a 3-day pass to be used within the week, or $60 for a 7-day pass to be used within the month. Dollars are accepted and typically preferred as currency as opposed to the Cambodian Riel. 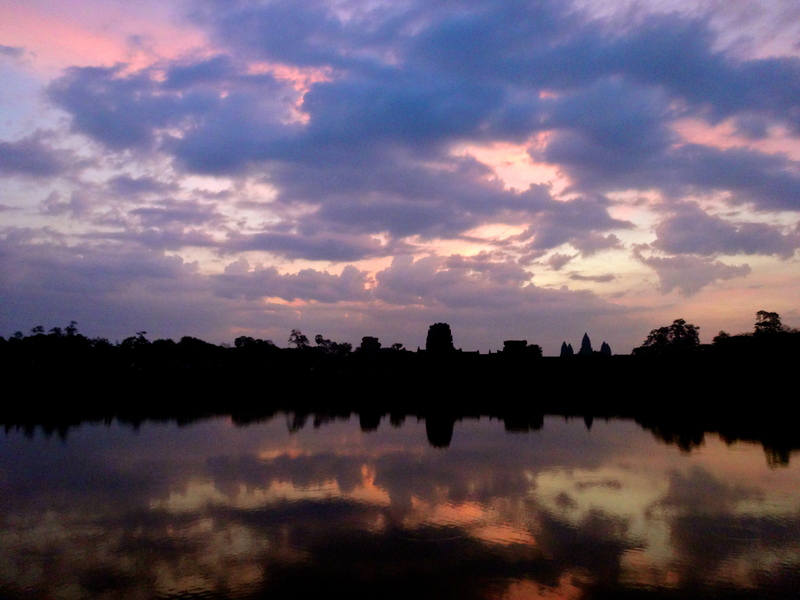 Just before sunrise at Angkor Wat on an overcast morning. 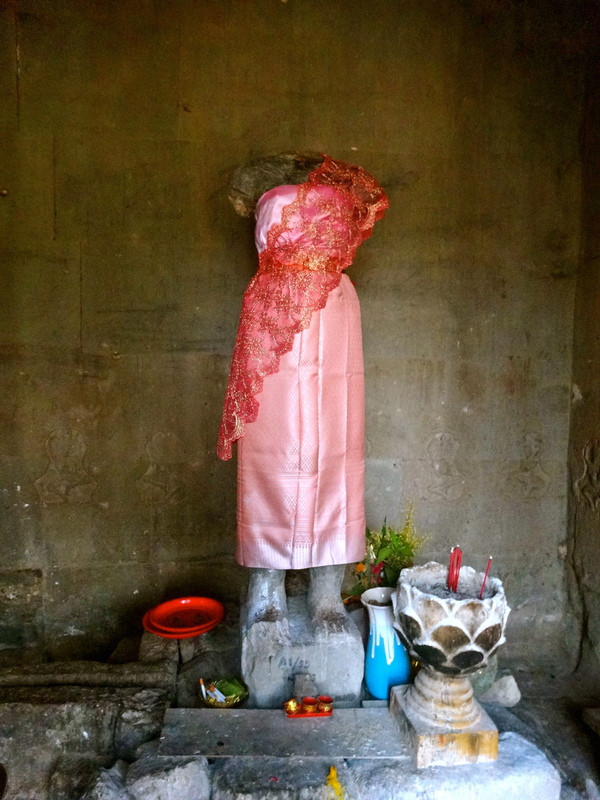 Beheaded statue reminiscent of the days of war. imagining characters walking down the long corridors of pillars, and trying to fathom what it must have been like living in the time that it was built. 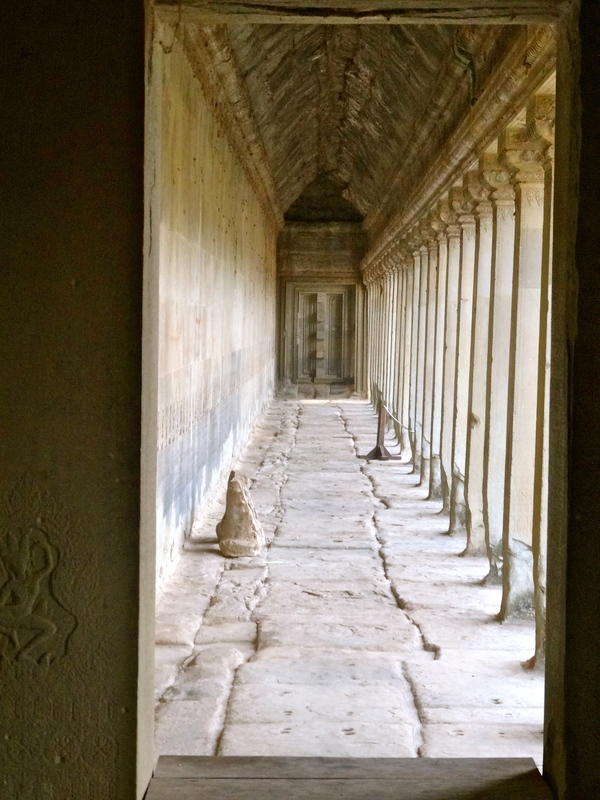 This temple has transitioned from a Hindu temple to a Buddhist one, as rulers changed reign over the years. It went through war after war during which the heads of statues have been cut off and sold. The rubble and remains of decay stand in corners of the grounds reminding us that pieces have had to be rebuilt and restoration efforts are ceaseless. It still stands as the tallest building in Siem Reap at 65 meters and city mandate dictates that nothing shall be built taller than it. For me, it was one of those places that carried the essence of past souls and if I sat down in a quiet corner away from the crowds I could almost hear them whispering to me. I was awed by its grandeur and humbled by its ability to survive through the ages…reminded once again that I am just a blip in history… prompting me to seize the moment and make my mark before my time has passed. 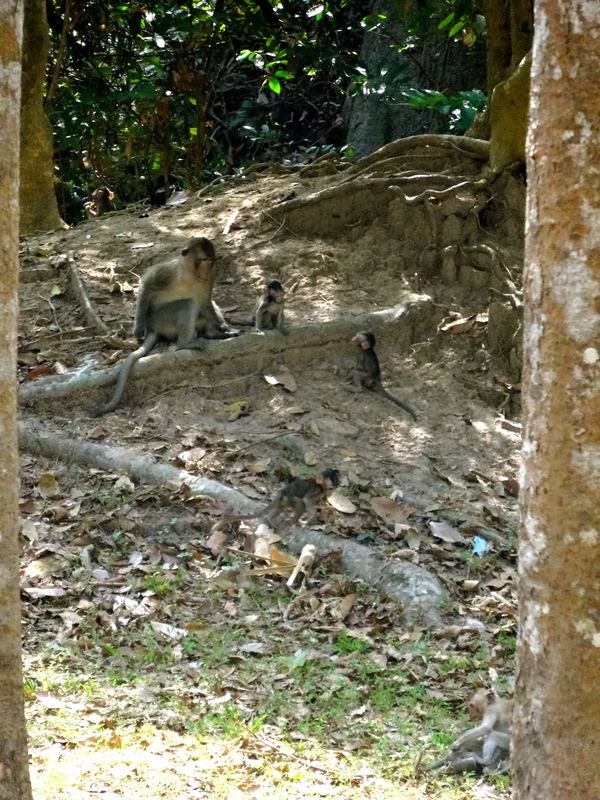 Monkeys playing on the grounds of Bayon Temple. enthusiasm because the sun was beating down on us by this point and this temple offered little cover not only because of its design, but also because of the size of the crowds that accompanied us. After hearing some history, and snapping some pictures, we were back to our bikes. Prohm. 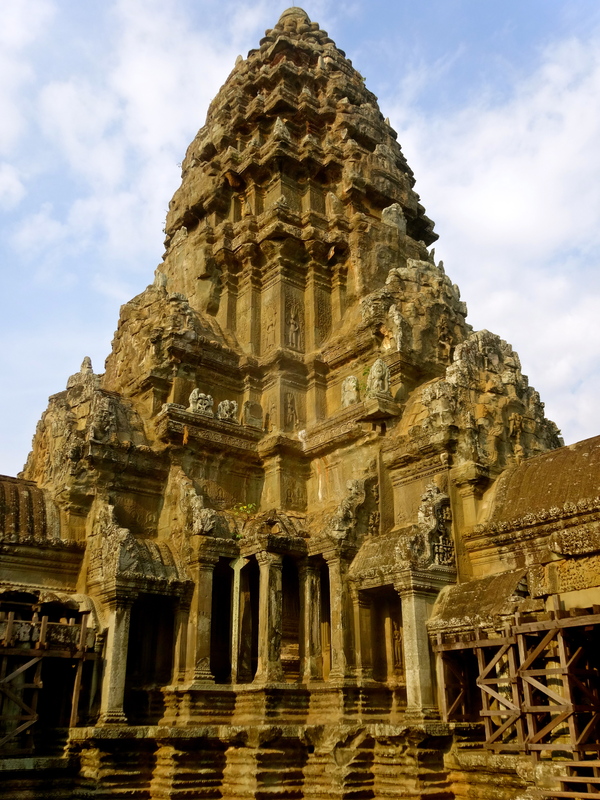 This 9th Century Temple has been made famous due to its appearance in the movie, Lara Croft: Tomb Raider with Angelina Jolie, and has worthily earned its recognition. 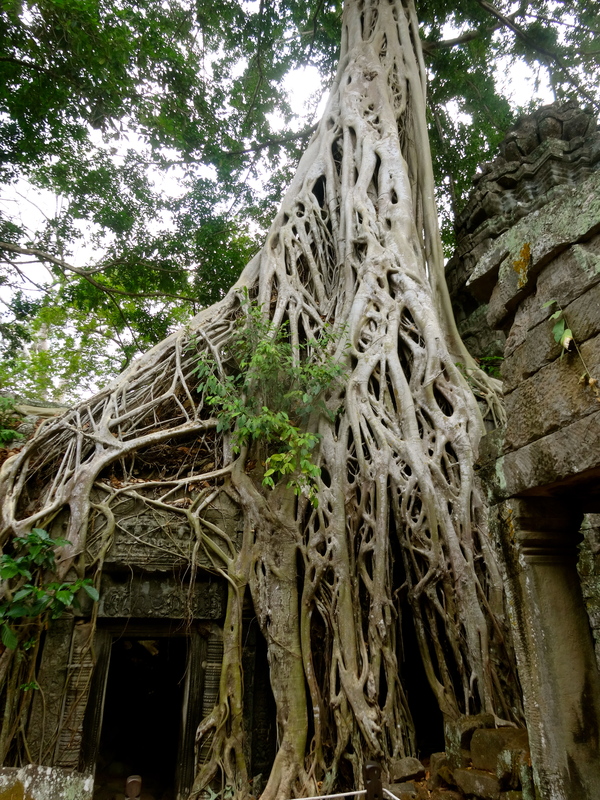 It was adorned with enormous trees whose roots offered just as much intricacy to the adornment of the temple as the stone etchings themselves. Nature and manmade construction had merged as one. 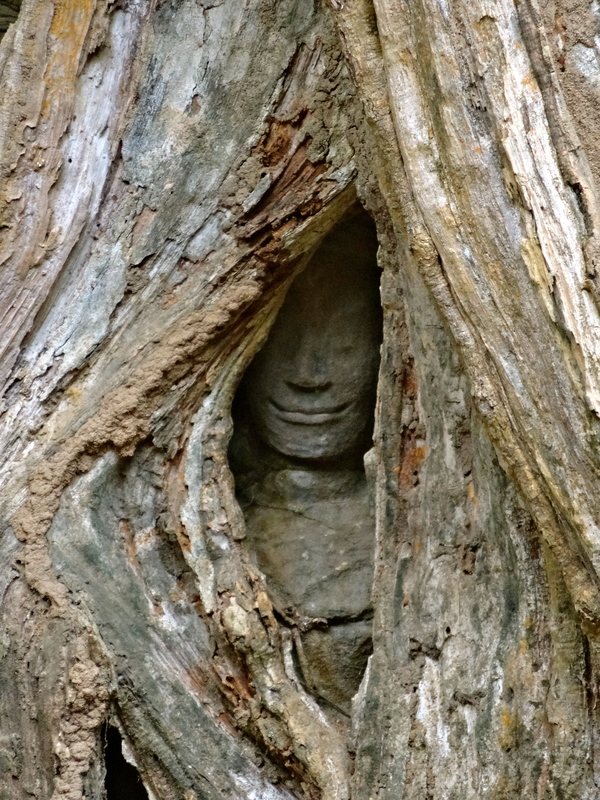 There were faces peeking through tree trunks, apsaras, female spirits of the clouds and water in Hindu and Buddhist mythology, dancing around the corners of entrances, and enormous tree tops casting shadows over the grounds. After wandering and admiring to our heart’s content, we hopped back on our bikes and rode away to a traditional Khmer restaurant where we enjoyed a variety of local dishes to end the morning and refuel us after our ride. 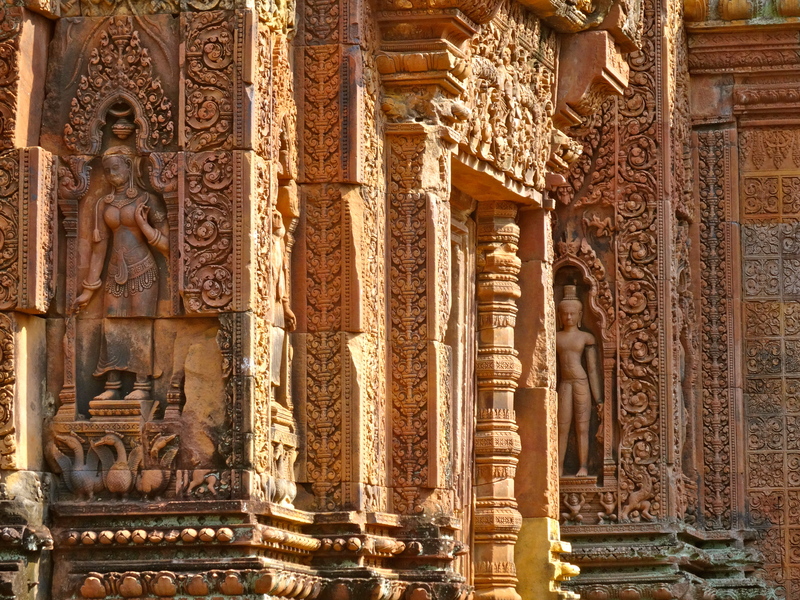 Carvings in Banteay Srei, “Citadel of Women”. I rode all over Siem Reap for four out of five days that week, including a countryside ride to learn about village life, a mountain ride to Kulen Mountain that tested my out-of-practice, technical mountain biking skills, and a road bike excursion to a temple that was 37 kilometers north of Angkor Wat, named Banteay Srei, meaning “Citadel of Women” and said to have such delicate carvings that they could only have been done by the hand of a woman. In total, I racked up over 150 kilometers of biking in intense heat, a personal record for me. Three of the days were on tours with Grasshopper Adventures, and one of the days was with a newfound travel companion, who is far better on a bike than I, and whose favorite pastime was slipstreaming tuk-tuks. On our long ride that day, I remember thinking, “huh, just another day cycling through ancient history”. It was otherworldly. 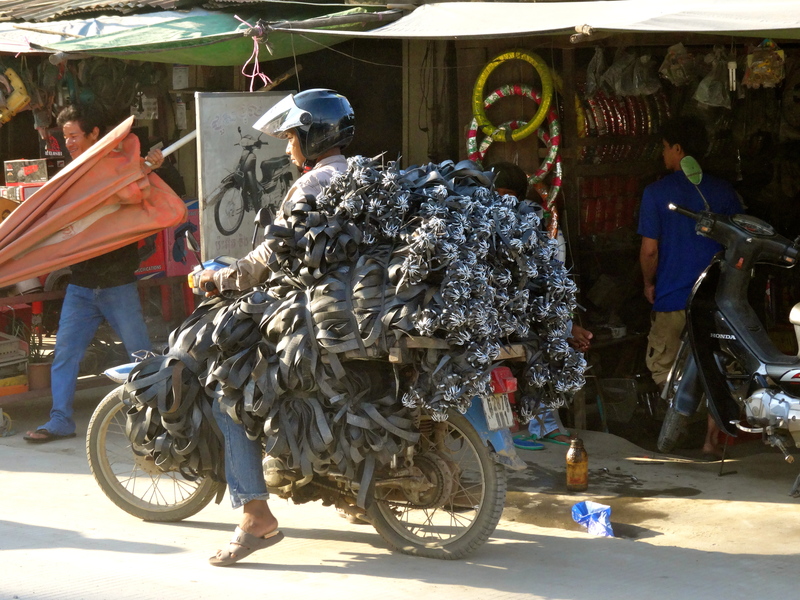 Example of overloaded motor bikes. drivers often don’t signal or even look before pulling out or merging onto or off the road, this small stretch required greater concentration and alertness than all of the rest of it combined. In the five short days of biking up and down this road, I witnessed two accidents and had to swerve twice to avoid paraphernalia falling off the back of overloaded motorbikes, barely avoiding a crash of my own… all of it quickly accumulating in the vivid memory bank of adventure that I have stored to recollect this country. Revelling in gratitude for sharing in the city’s history and making it out alive to tell the story. Message me if you want to meet up!